Apache is a very popular web server, and with that popularity comes a need to ensure its security. In this tutorial, we will show you how to harden and secure the Apache web server by installing and configuring mod_security and mod_evasive Apache modules. Mod_security is a free web application firewall (WAF) Apache module that helps to protect your website from various attacks such as PHP and SQL injection attacks, cross-site scripting, path traversal attacks etc. Also, it allows for real-time analysis and HTTP traffic monitoring with little or no changes of the existing Apache configuration. Mod_evasive is an Apache module that helps to prevent server brute force attacks and HTTP DoS (DDoS) attacks. The mod_security and mod_evasive Apache modules have several requirements which we have to install on the server in order to run them. We need to have Apache server installed and running with enabled mod_headers module. To enable the CRS optional and experimental rules files you may want to use, create symbolic links under the ‘activated_rules’ directory location accordingly. That is it. Mod_security and mod_evasive modules have been successfully installed on your Ubuntu VPS. In order to harden and secure your Apache web server it is a good idea to install and configure mod_security and mod_evasive modules on a Linux VPS with Ubuntu 16.04 OS installed on it. 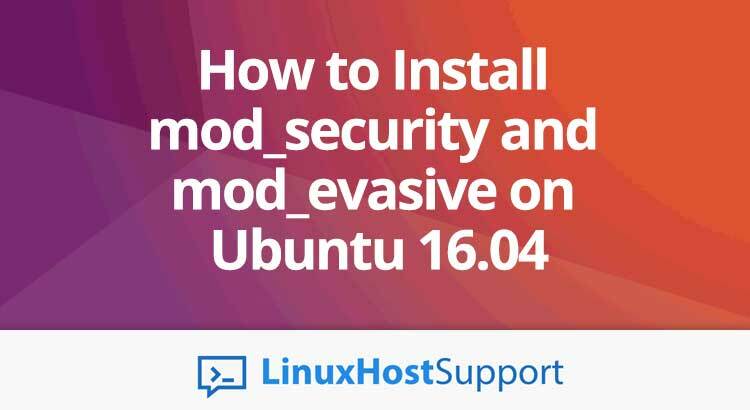 Of course you don’t have to install mod_security and mod_evasive on Ubuntu 16.04, if you use one of our server support services, in which case you can simply ask our expert Linux admins to setup this for you. They are available 24×7 and will take care of your request immediately. PS. If you liked this post on how to install mod_security and mod_evasive on Ubuntu 16.04, please share it with your friends on the social networks using the buttons on the left or simply leave a reply below. Thanks.